I got this recipe from the whole food simply blog. Her recipes are quite amazing..go have a look if you haven’t already. I substituted medjool dates for sultanas because I didn’t have dates. 4. Put in freezer to set. Note: if u let the bottom set in the freezer before adding the raspberry mix and top chocolate, it will be neater. I am keeping these in the fridge, not the pantry. 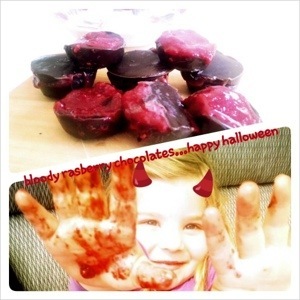 This entry was posted in Recipes and tagged cacao, coconut oil, dessert, gluten free, Halloween, home made, sugar free by mazivia. Bookmark the permalink.